Description: Freak of nature takes on a whole new meaning...If she hadn't been so clueless, she might have seen it coming. But really, who expects to get into a relaxing bathtub after a stressful day of shopping for tankinis and come out with scales and a tail? Most. Embarrassing. Moment. Ever. Jade soon discovers she inherited her mermaid tendencies from her mom. But if Mom was a mermaid, how did she drown? "Pleasantly plump girl bumps into cute (but evil) boy. A few polite words were exchanged. Girl and boy from parallel universes part ways, never to speak again." "Geesh! They really should invent a brain implant with a drop-down menu of witty comebacks because right then, I had nothing." "Hey Jade?' He called out holding two packages of maxi pads. I shook my head violently to stop Dad from talking, but from where he stood, I doubted he could see I was talking to a boy. A mildly annoying, but nonetheless cute boy. It was official. This was shaping up to be the Most. Embarrassing. Day. Ever." "I was in no mood to negotiate with the Tampon Terrorist." This sounds absolutely adorable... I can so see a Disney movie brewing! I've got to read it, pure and simple! Thanks for the introduction!! I just finished reading this with my daughter and we loved it too! This book is a great story about a girl who figures out she's a mermaid. 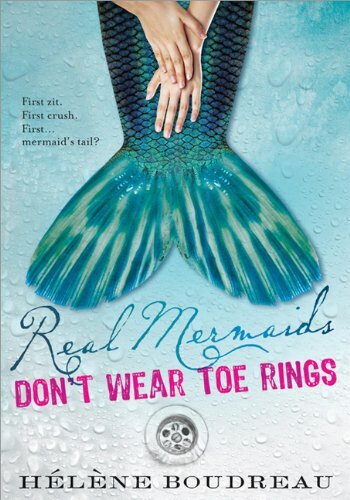 However, this book does NOT just blend into the background with all the other teen mermaid books. It has a real story behind it- something more than just a girl who has a fishy secret.